Comics In 5 Panels: Cartoon Month: Dave The Barbarian. This show only lasted ONE season?! If it wasn't because I knew that there was a awesome and very vengeful god, I would claim that there weren't one. 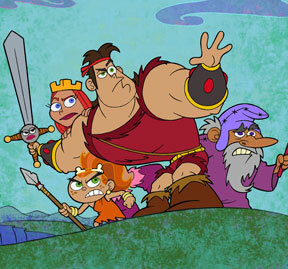 "Dave The Barbarian" follows the adventures of Dave, the most muscular wimp who ever held a sword. While his parents(the king and queen of Udrogoth) are away to fight evil across the globe, Dave must protect the kingdom with the aid of his magic and sarcastic sword Lula, his two sisters; Fang and Candy and their uncle, the useless wizard Oswidge. None of them are the greatest heroes in history, not even CLOSE! But they are all Udrogoth has. 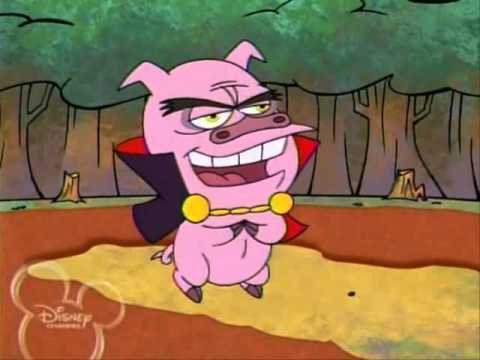 This more or less useless barbarian family must do their best to fight a horde of weird enemies, such as Chuckles, the ruthless(but adorable) lord of evil... Also, he is a talking pig. As you may have deducted by now, this show was weird! Weird as in "stupid weird!" And that's a compliment. The show has a charm that resembles Animaniacs. The show hits you with crazy stories, weird characters and insane plot-twist that makes you ask; "Dear god, WHY!? ", while the show replies; "Why not?" And Dave is simply to die for. Is is likable and unlikable at the same time, if that makes sense to you. Because he is really a nice guy. If it was up to him, he would devote his time to his interests, such as cooking and handcraft, all that stuff that would have been acceptable in our time period, but when you are an barbarian, living in the middle ages, you're a jackass. And none of that changes the fact that Dave a coward. And the thing is; he has no reason to be a coward. He is big, strong and has the skills of a great barbarian warrior. But he is easily scared, and prefer to hide behind something instead of drawing his goddamn sword and fight, for Christs sake!!! I highly recommend this overlooked family-show that is a lot like a fusion of "Animaniacs" and "Monty Python And the Holy Grail". Unfortunately, you can't get it on DVD, but it should be available on YouTube. That's all for now. Next time, we will take a look at the show that teaches our kids that starting a nuclear war is a GOOD thing.